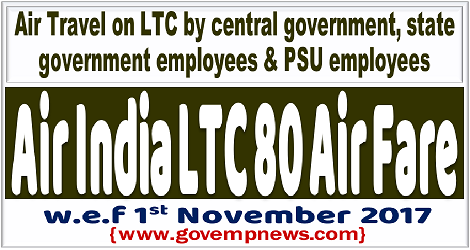 LTC Rules stipulates that Central Government Employees entitled to Air Travel while availing LTC will have to travel only by Air India on purchase of Air India LTC 80 Air tickets, a concessional air ticket applicable to Central Government Employees, State Government Employees, PSU Employees etc., when they travel under LTC. In the event of Travel by private airlines or non-purchase of Air India LTC-80 air ticket, the employee concerned will not be reimbursed with the Air fare claimed under LTC. Official ID card. In the case of purchasing LTC 80 Air Tickets for Family members they have to carry the copy of the Identity Card of the employee. Normal discount on the class of travel in respect of Children and they are not entitled to any additional discount. In the case of Infants (Under 2 years) 1st accompanying Infant – Rs.1000 per coupon, Plus applicable taxes. 2nd and more Infants, no discount permissible. Change of Date of Travel and Cancellation of LTC 80 Air Tickets are allowed subject to payment of fee applicable. Author’s Note: Government insists for purchasing Air India LTC 80 Air tickets for the reasons that these tickets are entitled to Change of dates and cancellation by default. So, neither the Govt nor the employee will incur loss in the event of change of date or cancellation of Travel Plan. In fact, there are many types of Air Fares are available in Air India itself which will be lesser than LTC 80 Air fare after discounts. However, Air Tickets in discounted price will not be allowed for changing date of travel or cancellation of tickets. 1 a) Fare Basis 'ZAP' with minimum 3 days advance purchase restriction. upto 90 days, 60 days, 15 days respectively in advance before schedule date of departure of the flight. 2 Flight Routing D- Direct flight to destination. b) User Development Fee (IN) (a)Ex Vishakapatnam, Amritsar, Udaipur & Varanasi where it is Rs. 177/-, Guwahati Rs. 392/-, Ahmedabad Rs. 130/-, Kolkata Rs. 530/-, Chennai Rs. 196/-, Lucknow Rs. 463/-, Hyderabad Rs. 508/-, Mangalore Rs. 161/-, Bengaluru : Rs. 362/-, Thiruvananthapuram Rs. 531/-, Jaipur Rs. 413/-, Kozhikode Rs. 224/-. ** No-Show charges waiver at airport for domestic sector for RBDs - H, K, Q, V, W, G, L, U, T, S & E in case, the passenger has reported at the Airport, (after closure of counter but before departure of flight) for a Domestic sector, and only when passenger is being rolled over / travelling on the next available flight of Air India.in such case to facilitate a no-show passenger the waiver of no-show INR.3000/- plus 12% (GST) for business class ticket & 5% (GST) for economy class ticket, to be authorised by the Airport Duty Manager at the time of flight only, and cannot be levied / waived at CBO. Further, fare difference if any as per the RBD / Fare Basis available / applicable on the next available flight, will have to be charged from the passenger in addition to the no-show penalty, plus applicable (GST) as mentioned above. In case of completion of part itinerary, a passenger desirous of claiming refund will be allowed to do so after deducting the applicable fareon booked RBD, for the sector travelled along with the applicable Refund Fee plus applicable goods & service tax(GST). (c) Own arrangement for the cancelled sector is made by the passenger(s): Refund of Basic fare of the cancelled sector in respective RBD along with unutilized non-airline taxes, if any.